Sminky lives in the legendary land of Siberia next to a huge pine forest. In his/her childhood she (he?) sang in a local church-choir and theatre and played violin. Later he (she?) tried to sing in different Siberian rock-groups. And now, she (he?) has just been sitting at home and doing music with his/her PC. 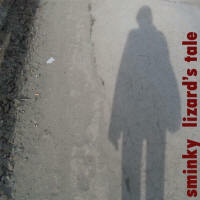 Lizard’s Tale, the second album by Sminky, consists of songs created at different times. That’s why they sound so different. There is classic rock, like the track called Theatre and there’s something absolutely abnormal, like Clear. There are songs in English and songs in Russian and two instrumental tracks (Chocolate Way and Nail Polish Dance – Sminky’s first experience in making instrumental music. Lizard’s Tale by Sminky is licensed under a Creative Commons Attribution-Noncommercial-Share Alike 3.0 Netherlands License.